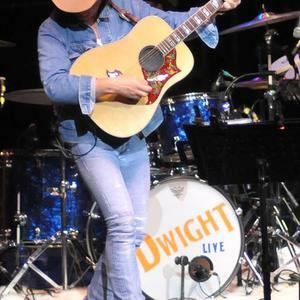 Purveyor of the bakersfield sound, country singer-songwriter Dwight Yoakam grew up in Columbus, Ohio before first heading to Nashville and eventually west to Los Angeles, and bought a place in Bakersfield, CA near his idol & mentor Buck Owens. Active as a recording artist since the early 1980s, Yoakam has appeared in films, on over thirty charting singles on the Billboard Hot Country Songs chart, and a plethora of albums and compilations selling well in excess of 20 million units worldwide. His distinctive twang sound has been linked with production & arranging collaborator Pete Anderson who has helmed the boards for the most commercially successful period of Yoakam's career. Starting out in the early 80's in L.A Yoakam's group played with "roots" acts like The Blasters, eventually covering their song "Long White Cadillac". Other popular covers by Yoakam include Queen's "Crazy Little Thing Called Love" in 1999, and ZZ Top's I'm Bad, I'm Nationwide in 2003. Dwight has Yoakam'd out other unlikely songs by not exclusively country related groups like The Grateful Dead, The Kinks, The Clash and Cheap Trick'sI Want You To Want Me. One of his first breakthrough records was a song done by Johnny Horton called "Honky Tonk Man", another stand out cover track was his reworking of Elvis Presley's "Suspicious Minds" done with Pete Anderson for the 1992 Honeymoon In Vegas soundtrack. His own hits like "Guitars, Cadillacs" and "A Thousand Miles From Nowhere" are classic songs in their own right, but nearly every song or cover Yoakam churns out stays true to his sound, and finds welcome among fans of both roots music & modern country. With 1989's Grammy winning "The Streets of Bakersfield", Yoakam was credited with revitalizing the career of the late Buck Owens, who'd fallen out of favor with the pop-oriented contemporary Nashville music industry. Yoakam's more recent releases on New West after a long period with major labels include "Blame the Vain", and the posthumous Buck Owens tribute Dwight Sings Buck. Both continue in the solid and traditional styles of past albums from this long time fan favorite who continues to please crowds all over the country and who has performed on the NBC's Tonight Show with Jay Leno more than other act in history (24x as of late 2007).